Trustees and Keurig Volunteers at Work! On Thursday and Friday, August 24 and 25, a group of volunteers from Keurig Corporation worked with The Trustees to make major repairs to badly eroded trails. 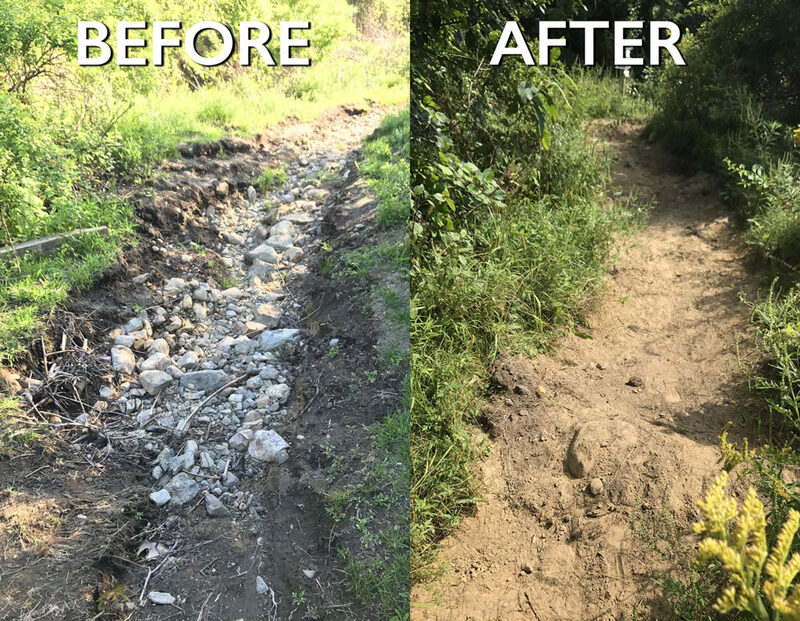 The volunteers also cleared some grown-in trails, but the repair of eroded trails was a growing eyesore and problem that these folks worked hard and solved. There were a number of trail sections that were eroding badly, becoming difficult-to-walk piles of stones. The Keurig volunteers not only filled in a number of these washouts, but all dug many diversion ditches across trails to prevent future erosion. The Trustees (of Reservations) are in the process of working out a park management agreement with Boston, the actual trustee of the Mary Cummings Trust. But even before that process is all set, the Trustees are making a major impact at the park by coordinating volunteer efforts of many local companies. Keurig was the most recent firm to work with The Trustees, but many others are lined up. The combination of the trail expertise that the Trustees bring, combined with the substantial people-power from our corporate citizens means that we can expect to see major improvements to many aspects of the park over the coming months and years.